If you fancy doing something a little bit different this Festival, try The Edinburgh Comedy Tour. Walking Heads is literally a hysterical walking tour of Edinburgh using your MP3 or Android / iPhone clamped to your lugs with buckets of laughter thrown in. Starting at The Fringe Office, the tour takes you around loads of comedy haunts including the Royal Mile, the Assembly Halls and Bristo Square with wit, anecdotes and historical facts thrown in. The surreal pair are ably enabled by top Scottish comedians, Bruce Morton and the divine Susan Morrison. For example, Susan will crack you up with descriptions of Edinburgh’s Pubic Triangle and some of the colourful characters that can be found limbering up for The London Olympics 2012. The ultimate destination is The Stand Comedy Club, in York Place, the comedy mecca for wise-crack-addicted audiences and their entertainment dealers of a comedic bent. Edinburgh has been the launch pad of many a must-see comedian. They’ve all suffered and relished in the drollery and hoopla of the Edinburgh Fringe Festival. In fact some of the venues have been fighting for official titles over who launched whose comedy career. This is a comedy event / product / series that will tickle any amateur or professional comedy fan’s fancy. In fact, it’s already won funding from the Scottish Enterprise Tourism Innovation Fund because Walking Heads promises to take people off the beaten track to reveal the true grit of the place. So if you happen upon some random tourists cackling away to themselves and pointing at odd statues and monuments across the city, you’ll understand they’ve been plugged into a brilliant new comedy tourism product. 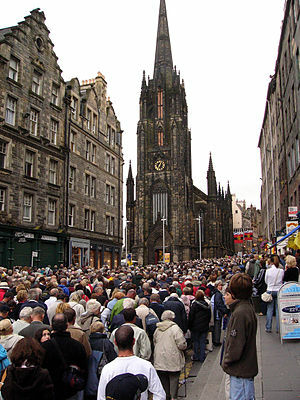 Know any other wicked walks and tours in Edinburgh? I’ve not been on any. Have you? Any views? Thanks Fin, I think you hit the spot beautifully with this review as the aim of Walking Heads audio tours is to mix historical fact with real personal memories – and somehow on the comedy tour a little madness creeps in. I know there are other excellent walking tours in Edinburgh and I’m taking up your challenge to add some to your list. They are not historical walking tours but both uses streetscapes in different ways to evoke memories and emotions. There are also new (and not so new) New Town audio tours but they are somewhat more tartan and conventional than Edinburgh Comedy Tour! And of course you can cheat and listen to extracts from the comedy tour for free and without getting up off the sofa (though with any luck it will make you want to hit the streets).